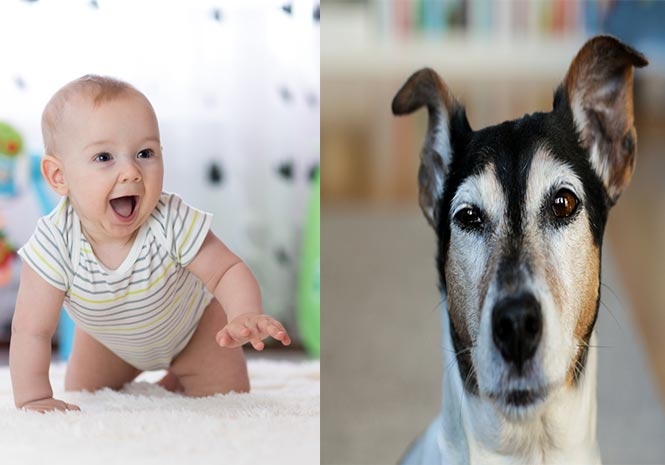 GRADUALLY introduce changes in your dog’s routine as soon as you know baby is on the way – if he does not connect them with the baby’s arrival he has less reason to be jealous. – Your dog should not be the centre of attention at all times, and should not sit on your lap (if at all) only when invited by you. – Get him used to being away from you sometimes in another room, or indoor kennel (‘crate’), and ban him from the nursery. – Take a refresher course at a training school, and think about practice walks with the pram – it can be trickier than it sounds! – Check with your vet about canine hygiene and worming. When your baby is born your dog may be left for hours while you are in hospital, or upset by the excitement if you are at home. Arrange for someone he knows to look after/walk him. It is an old wive’s tale (letting your dog drink breast milk or play with dirty nappies) this will not help your dog and baby to become friends, but sending home a blanket that the baby has slept on may help your dog to get used to her scent. When you come home let someone else hold your baby while you greet your dog; introduce them later when he is calm. Do not try to keep your dog and baby completely apart, you won’t be able to keep it up! Teach them both to interact calmly and gently, no licking by the dog or grabbing by the child. Toddlers can accidentally injure or alarm dogs (eg by falling on them) and startled dogs may react impulsively, lashing out or biting. The most tolerant dog needs peace and quiet sometimes; allow him a place (eg his bed) he can escape to without being followed. Allow the child to go there at other times to prevent it becoming an exclusive area which he feels entitled to defend. When your baby starts to crawl and walk teach your dog to step back out of her way in doorways and on stairs. Previous articleCan their plan work? Next articleFive courses or nothing!